Any combat always does not last, because in His grace, the Lord hears our cries and answers the aspirations of our hearts. After each one a long time in different lives, he has joined together us for the best and the best: The encounter to his Holy Trinity, Father, Son and Holy Spirit. There are no chances in front of God, there are only the miracles of its Love which remain eternity in eternity, and in front of which our hearts sparkle with enthusiasm. At the time of our encounter, Marie-Claude was a nurse in psychiatric background. Since few months, she was raising alone, her three children. She was relieved of a difficult union that had made of her a woman beaten morally and physically. In her cry to God for go out there she had not asked an haven of peace for herself, but her prayers was first, that these children become neither of the delinquents, nor of the pillars of psychiatric hospitals. Catholic since his birth, she was practising in front of God, but not in front of the men, and in the minutes preceding her childbirths, in her heart, she had give gift of her children to God. Hidden of their father, she had then transmitted the simple faith from Jesus to them. They were addressing to him every evening in their prayers of blessings for their mom, but also their dad. One Saturday evening of February 1986, whereas she refused under any form all new conjugal life, her neighbours and friends persuaded her to go to a fancy dress ball. She entrusted to her elder son her two younger children, who hiding of the largest, on their knees, at the foot of their bed, turned towards the window, asked Jesus to find a new dad to them. They were old of eight and six years and half, and a few months earlier they had just be separate of this dad for the many years of his imprisonment. It is thus that this night we met us, and that fifteen days later, we started to form a couple. 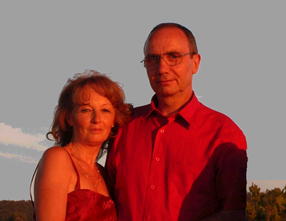 From self-educated formation, Alain started a small engineering firm and construction in agro alimentary sets, when we met. Married not by love but by sacrifice, it persevered in a cause lost in advance in order not to make of evil to its family and particularly to his two children. He would have liked to make them happy, but confronted with his passions; his goodwill resembled a bored basket. He was in fact the best possible representation of the human goodwill that rejected the total existence of God. Catholic since his childhood, it had had the heart turned a time towards Jesus, but was considering him any more only as extraterrestrial. Very combative in the sport and in his social life, he was not very violent. The only hatred and derision that he expressed openly were towards the weak ones who turned to God. Those were mentally retarded persons for him. God liked him as he likes each one of us, and knew, it is better to be cold or boiling rather than tepid. The icy was going to become more than ebullient at the blessed day of "his" Pentecost. Was not this the most important? Since our first hours of Christian life, we invested ourselves of the same heart in the discovery of this new life, and the discovery of so much of miracles transported us joy. Alain was discovering flabbergasted all nonsense which had hitherto led it and the dreams of Marie-Claude were concretising by his children who were sharing with us the same enthusiasm. We were penniless, having all lost to arrive there, but we would run together with family to the evangelic meetings, the transported heart of joy. It was certainly not balance, but it was like an wild youth, bubbling of joy, in a thirst without end for the bible, the marvellous word of God. Few days after our marriage, two years of biblical school perhaps trained us, but the true way of perseverance was this one of "the exile". An exile of step back, an exile of meditation, an exile of formation out of the way of the tumultuous assemblies, enabled us to achieve in the secrecy of God, the work reported particularly in the Boomerang Effect. At this point in time we started to become aware that we had sometimes confused faith and presumption, fear and wisdom, and so much other things to which we had simply given reason in our soul, without the spirit being renewed. This “psychotherapy”, deeper than that generally accomplished by the man, had not always done in the joy of the questioning. It would have been necessary at us for that, to have in ourselves the image to which God wanted to lead us. The important was don't to lose the reference mark of his cloud, his presence, and glory to have followed him doesn't return to us but to Him only, which unceasingly put reference marks on our way. We knew the objective of this way, even if often we fought it, for lack of comprehension. God had asked us indeed a day by the intermediary of a sister in Christ; if we were accepting that he disassemble the bridges of the world than had been built between us, to rebuild them according to him. In the same impulse of our heart, we had answered large yes this day without hesitation, happy to be able to make the will of God in the few days that would follow, we thought. Fortunately, for us who had taken this engagement, God knew then how much time he should provide for our failures, and he stuck to always his promises made in its Word. It is thanks to that we can be delighted, because even if the way had full with torments, the important thing is as Job to be able to say today: “My ear had heard of you, but now my eye saw you”! In our first bursts, at the end of the school, we would have been only blind men who would have to try to build others ourselves, some clones. In their vanities the men, from which we do not escape, likes often to think he is a spiritual guide, but God alone is the good Shepherd. We try our self to transmit a testimony and an exhortation more than a guide does, and because this testimony is not a lesson learned by heart, but a tangible real-life in communion with God, we believe to have the duty to communicate it. Any religion in its goodwill cannot save, and we do not do better. Like many other, we just try to make known Jesus, through communion with the Holy Spirit, He is him the Saviour, and it is with him that each one must remain attached by the faith for to be saved. In that, the almost totality of what the man can transmit resides, the remainder being only vanity. In agreement with Ecclesiast, we can therefore affirm: Alone to God come back all Glory! Come Lord! Oh Come Lord! Blessed us all! Blessed us from your Love and your Holiness!